Our design and creative teams developed a brand identity for Gemini Tiles that could be easily adapted across a variety of platforms, from social media to print brochures and the website. In addition to updating the identity of the brand, our digital team designs, produces and publishes exciting and engaging online content for Gemini Tiles across social media, ensuring that the original content delivers accountable and valuable results. As part of Gemini Tiles’ online marketing launch campaign, the design team developed an identity that would sit across all of the newly created social media platforms. Ensuring a continuation of brand identity, our creative team worked with and updated the existing logo to create a social media brand identity that is both flexible as well as easily recognisable. 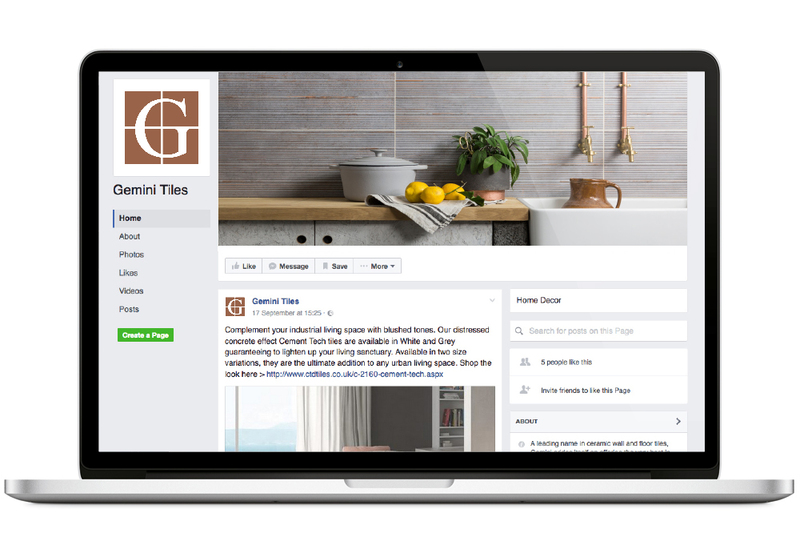 Incorporating a simple yet effective design element into the logo has allowed the Gemini Tiles brand to develop a strong and recognisable social media presence. As an easily changeable design, the social media brand identity is able to remain on trend and inspirational through changing colour themes whilst remaining true to the brand. Supporting the social media launch campaign, the new brand identity enables the Gemini Tiles platforms to remain eye-catching and on trend. Incorporating corresponding colours and themes depending on ongoing campaigns and content ensures that the branding is fully integrated into the ongoing activity.